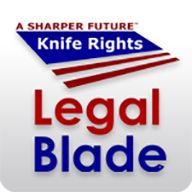 Knife Rights - Knife Rights LegalBlade™ App Introduced - World's First Knife Law App! Knife Rights LegalBlade™ App Introduced - World's First Knife Law App! 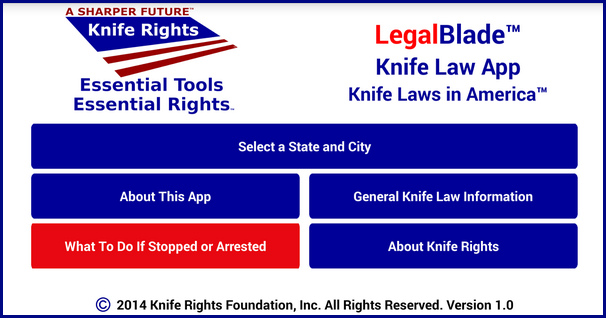 Knife Rights Foundation is pleased to announce its groundbreaking LegalBlade™ App - Knife Laws in America™. LegalBlade™ is the world's first knife law app! LegalBlade™ provides guidance at your fingertips to the knife laws of all 50 states as well as over 40 cities and local jurisdictions in the United States. Knife Rights Founder and Chairman Doug Ritter said, "While Knife Rights will continue to aggressively work to repeal bad knife laws, knowledge of the law is the first step in avoiding an unfortunate arrest, loss of your knife or other legal complications." Click on "Read More >>>>" for additional details. Ritter explained, "Knife Rights is rewriting knife law in America. With 14 bills passed in just the last five years in the states, our aggressive legislative activity has obsoleted all available knife law resources, many of which were not all that accurate to begin with. It only makes sense for Knife Rights to lead the way by providing knife owners with knife law information, instantly accessible."